Ballet Philippines, reintroduces internationally acclaimed classics of the company’s vast repertoire to a newer audience. "The Exemplars" will showcase the company’s classic works such as Alice Reyes’ “Amada.” As one of the first pieces ever performed by the company, Amada is based on “Summer Solstice” by National Artist for Literature, Nick Joaquin. Set in Catholic, Hispanic, 19th century Manila, traditional male-dominance is shaken by the Tadtarin, a native festival in which women suddenly reign supreme shattering the established Hispanic molds and patterns. Amada premiered in Manila in 1970, with National Artist for Dance, Alice Reyes herself in the titular role, and music composed by National Artist for Music Lucrecia Kasilag. It has since won critical acclaim in the Philippines and abroad, and represents the company’s work in Philippine material at its best. Another featured work is “Valse Fantasy.” A male dancer and three ballerinas dance in a ballet dotted with leaps, turns, beats, entrances and exits. Set to Glinka’s music, Valse Fantasy is pure dancing tailored by the music’s breezy patterns and delightful rhythms. A neo-classical piece inspired by George Balanchine, it was especially staged for Ballet Philippines by Muñeca Aponte in 1974. This year, premier danseur Nonoy Froilan is restaging the ballet, as he himself danced the male role in the 1970's. Gener Caringal’s “Ang Sultan” is a heart-breaking story about star-crossed lovers, separated by the eternal clash between classes. Set in the pre-colonial Filipino caste system, it tells the story of the consequences when a man from a lower caste falls in love with a princess—where revolt and an uprising ensue due to inequity and social injustice. Using Maguindanao/Muslim instrumentation, the music was composed by Lucrecia Kasilag. Since it’s premiere in 1973, it has become one of the most performed pieces in the company’s repertoire. Norman Walker’s “Songs of a Wayfarer” is the story of unrequited love. We follow our hero, who is in deep sadness as his love is being wed to another, and trying to escape with everything reminding him of his love. This is a story of ultimately finding one’s self in the loneliness of life, even though surrounded by friends, there is a feeling of trying to find a purpose that fulfills the empty void. Critical and popular acclaim has made this work a piece de resistance in the company’s repertoire. Pauline Koner’s “Concertino” is considered a major landmark in modern dance. This classic tells the story about a lady of the court and her attendants who conduct themselves in various manners from the proper to the frolicsome. In the rigidity of the high life she feels caged and seeks liberation from the tedious life. This piece was choreographed in the earlier style of American Modern Dance that has become a challenge to all who attempt this stylistically difficult piece. This production provides a rare opportunity to shed light on the long-unseen works that established the company’s signature style and identity as an internationally and locally renowned dance company, paving the way to 48 years of artistic excellence and cultural contribution. This was made possible by patrons of the arts San Miguel Corporation, Phoenix Petroleum and Sanicare. Catch us! 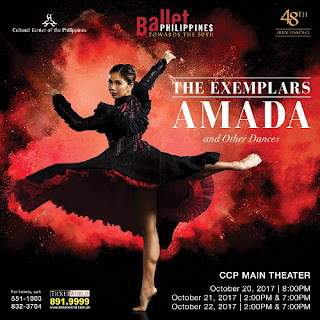 Ballet Philippines' "The Exemplars: Amada and Other Dances" will be performed in on October 20-22, 2017 at the CCP Main Theater, and October 25, 2017 at the Globe Auditorium, Maybank Theater, BGC Arts Center. For tickets, call Ballet Philippines at (+632) 551-1003, the CCP Box Office at (+632) 832-3704, or Ticketworld at (+632) 891-9999 or Ticketworld.com.ph.